KINGS MOUNTAIN, the fierce attack of American frontiersmen on October 7, 1780, against Cornwallis' scouting force under Ferguson, was an unexpected onslaught carried out in the foothills of South Carolina. This sudden uprising of the stalwart Alleghany mountaineers, for the protection of their homes and people from the threat of Tory invasion under British leadership, was relatively isolated in conception and execution from the main course of the Revolutionary War in the South. Maj. Patrick Ferguson, British commander at the Battle of Kings Mountain, and inventor of the breech-loading rifle bearing his name; from a marble bust. Clearly uncontemplated in the grand British design to subjugate the South in a final effort to end the Revolution, this accidental encounter in the Southern Piedmont delayed incidentally, but did not alter materially, the movement of Britain's Southern Campaign. Kings Mountain is notable chiefly perhaps as supplying the first definite forewarning of the impending British military disasters of 1781. It was decisive to the extent that it contributed the earliest distinct element of defeat to the final major British campaign of the Revolution. The extraordinary action occurred during one of the bleakest periods of the Revolution. A major change in British military strategy had again shifted the scene of action to the South in 1778. Faced by a discouraging campaign in the North and assuming that the reputed Loyalist sympathies of the South would be more conducive to a victory there, the British war ministry had dictated the immediate subjugation of the South. With the conquered Southern provinces as a base of operations, the war office planned to crush Washington's armies in the North and East between offensives from North and South, and thus bring the defeat of the more stubborn Revolutionary Northern colonies. Unimpeded by effective resistance, this Southern Campaign swept unchecked through Georgia and part of South Carolina during 1778-79. The surrender of Gen. Benjamin Lincoln's American army at Charleston, in May 1780, greatly strengthened the British hold on South Carolina. Encouraged by the British successes, the Royalist and Tory elements of the Georgia and South Carolina lowlands rose in increasingly large numbers to the support of the Royal cause. Soon most of South Carolina, except a few districts in the Piedmont, were overrun by British and Royalist forces directed by Cornwallis, and he was maturing plans for the invasion of North Carolina. His designs were upset temporarily by the advance of a new American Army under Gates. Meeting Cornwallis near Camden, August 16, 1780, Gates suffered a disastrous defeat, again leaving South Carolina and the route northward open to the British. By September, Cornwallis again had undertaken the invasion of North Carolina, gaining a foothold at Charlotte, a center of Whig power, after a skirmish there late that month. The sole Southern region in the path of Cornwallis' northward march which had remained undisturbed by the course of the war lay in the foothills and ranges of the Alleghanies stretching through northwestern South Carolina, western North Carolina, and into the present eastern Tennessee. Only here, among the frontier settlements of the independent mountain yeoman, could the patriotic Whigs find refuge, late in the summer of 1780, from their despised enemies, the propertied Royalist and Tory forces aroused by Cornwallis. Occupied with establishing a new frontier and protecting their rude homes from the nearer threat of the border Indians, the mountain men had been little concerned with the war on the seaboard. The influx of partisan Whig forces seeking sanctuary first brought the effects of war vividly before them. But from the free and comparatively peaceful existence, the backwoodsmen were soon to be aroused to the protection of their homes and possessions by a threat of direct aggression. That threat came from Maj. Patrick Ferguson, of Cornwallis' command, who, after Camden, had been ordered to operate in the South Carolina Piedmont to suppress the Whig opposition remaining there and to arouse the back country Tories, organizing their strength in support of the British cause. Encountering little organized Whig resistance, and having rapidly perfected the Tory strength in the Piedmont, Ferguson in September 1780 undertook a foray against Gilbert Town, a Whig outpost in North Carolina, near the present town of Rutherfordton. Fearful of such an invasion, the border leaders, Isaac Shelby, of Sullivan County, and John Sevier, of Washington County, North Carolina (both now in Tennessee), had hurried to the Watauga settlements and called for volunteers to defeat Ferguson. They also forwarded urgent appeals for aid to Wilkes, Surry, Burke, and Rutherford Counties in North Carolina, and to Washington County in Virginia. From Gilbert Town, early in September, Ferguson dispatched his famed invidious threat over the mountains to the backwoodsmen, warning them "that if they did not desist from their opposition to the British arms and take protection under his standard, he would march his army over the mountains, hang their leaders, and lay their country waste with fire and sword." Actually this was but an empty gesture from Ferguson who was then preparing one final foray across the border in South Carolina before making a junction with Cornwallis at Charlotte. Yet, to the freedom-loving frontier leaders the threat became a challenge which strengthened their determination to destroy the invader. Thus spurred, they assembled quickly, each in hunting garb, with knapsack, blanket, and long hunting rifle, most of them mounted, but some afoot. They were united by a strong resolve to destroy Ferguson and his Tory force, even though they had many a brother, cousin, or even a father among the back country men in his command. In fact, the partisan and internecine warfare, which raged during the Revolution through the southern highlands and along the Piedmont with members of the same family arrayed against each other as Whig and Tory, reached a climax in the Kings Mountain expedition and engagement. Assembling near the present Elizabethton, Tenn., late in September, the mountaineers circled southeastward into upper South Carolina, in swift pursuit of Ferguson. Joining the forces of Shelby and Sevier were the Virginians under Campbell, and as the expedition marched southward it was augmented by the border fighters under McDowell and Cleveland. Though characterized by daring impulse, the purpose of this strategic frontier uprising had been conceived coolly by these leaders, and its execution, in pursuit and assault, was to be brilliantly carried out. At the Cowpens in upper South Carolina, the expedition was joined October 6 by further volunteers under local Whig leaders, including Chronicle, Williams, Lacey, and Hawthorne. Recruits brought definite word of Ferguson's whereabouts near Kings Mountain. And there, in a final council of war, were selected 910 stalwart fighting men, all mounted, who immediately moved through the night upon the position of Ferguson's Provincial Corps and Tory militia, now encamped atop the Kings Mountain spur. Despite the added discomfort to their already fatigued bodies and mounts, the expedition pushed determinedly through the cold night rain, and en route the leaders, now commanded by Campbell, devised a final plan of attack. Having agreed to surround the spur and gradually to close in upon its defenders from all sides, the Whig attackers engaged the 1,104 British Provincials, Tories, and Loyalists at about 3 o'clock on the afternoon of October 7, 1780. In the sanguinary one-hour engagement that ensued along the heavily wooded and rocky slopes, the backwoodsmen, veterans of countless border clashes even if untrained in formal warfare, gained a complete victory, killing or capturing the entire British force. The most illustrious casualty was, of course, Maj. Patrick Ferguson, the British commander. 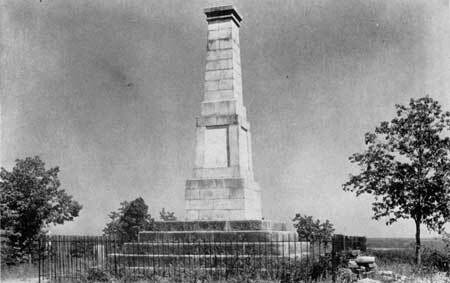 The Centennial Monument at Kings Mountain, unveiled on the 100th anniversary of the Battle, October 7, 1880. The extraordinary action is memorable primarily as an example of the personal valor and resourcefulness of the American frontier fighter, particularly the Scotch-Irish, during the Revolution. It demonstrated the proficiency with which he took advantage of natural cover and capitalized upon the ineffectiveness of the British downhill angle of fire in successfully assaulting Ferguson's position. The resulting casualties clearly exhibited the unerring accuracy of the long rifle used in skilled hands, even when confronted with the menace of Ferguson's bayonet charges. The engagement also afforded one of the most interesting demonstrations during the Revolution of the use of the novel breech-loading Ferguson rifle. The Kings Mountain expedition and engagement illustrated the characteristic vigor of the untrained American frontiersman in rising to the threat of border invasion. It recorded his military effectiveness in overcoming such a danger and his initiative in disbanding quietly upon its passing, especially when guided by strategy and tactics momentarily devised by partisan leaders of the caliber of Shelby, Sevier, Campbell, Cleveland, and Lacey. Only a few original Ferguson rifles are extant. The one shown is exhibited at Kings Mountain National Military Park, South Carolina. Here we see the profile of the piece with an 18-inch ruler to indicate scale. To the long standing local strife between Whig and Tory, the results of Kings Mountain were direct and considerable. It was an unexpected blow which completely unnerved and undermined the Loyalist organization in the Carolinas, and placed the downtrodden Whig cause of the Piedmont in the ascendancy. Kings Mountain was a climax to the social, economic, and military clashes between democratic Whig and propertied Tory elements. In a sense it epitomized this bitter struggle and its abrupt ending on what then was the southwestern frontier. Heartening to the long repressed Whigs, the engagement placed them in the control of the Piedmont, and encouraged them to renewed resistance. The disintegration of Loyalist power in the Carolinas after Kings Mountain temporarily proved a real obstacle to Cornwallis' hitherto unchecked northward movement. The demoralization of the Loyalist forces, which were the main reliance for local support in the prosecution of his campaign, left Cornwallis precariously situated in hostile North Carolina territory with a renewed Whig threat to the rear in South Carolina. Momentarily discouraged, he halted his North Carolina offensive and retired from his foothold at Charlotte to a defensive position at Winnsboro, in upper South Carolina. Here he remained inactive, with his campaign at a standstill, until the approach of reinforcements at his rear, under Leslie, enabled him to resume his invasion of North Carolina early in January 1781. 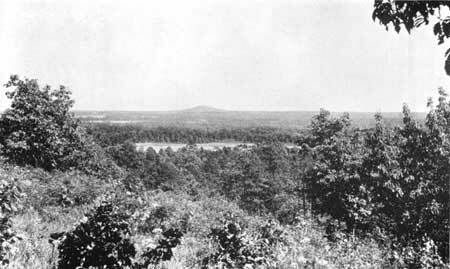 View of the Kings Mountain region, taken from the eastern slope of the battlefield ridge, looking northeastwardly toward Henry's Knob. This time Cornwallis' march was more cautious in its initial stages. For the enforced delay of the major British advance occasioned by Kings Mountain and lengthened by indecision, had enabled Greene, the new American commander in the South, to reorganize his shattered and dispirited army and launch a renewed and two-fold offensive upon the main British movement. It was this offensive in 1781, which first successfully struck the British at Cowpens, then rapidly withdrew through the Piedmont, further dissipated Cornwallis' energies at Guilford Courthouse, and prepared the way for the American victory at Yorktown. 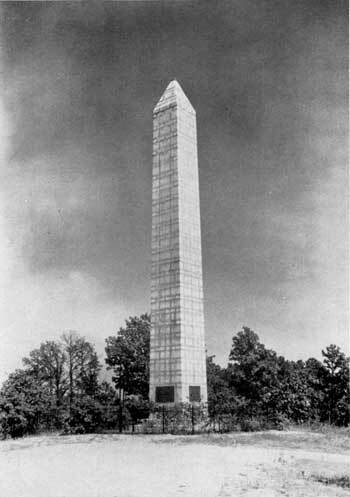 Granite obelisk erected by the Federal Government at Kings Mountain in 1909 to commemorate the Battle. By providing an unexpected American victory on the South Carolina border, Kings Mountain prevented the immediate subjugation of the Carolinas and temporarily deranged the British campaign to establish a completely conquered southern base of operation. By producing a feeling of patriotic success at the inception of the final major British campaign, Kings Mountain contributed to the renewing of American resistance which resulted in the British disasters of 1781. *From The Regional Review, National Park Service, Region One, Richmond, Va., Vol. III, No. 6, December 1939, pp. 25-29.